You are most welcome to browse around. It will be developed and expanded further as time permits. Knife making takes first priority so site updates are often delayed when orders are numerous and hours are few. I am Charl Marais. I forge blades from steel and this is how I came to do it. I was around 5 years old when I picked up a piece of brandering (Pine) in my Grandfather's workshop. Using a back saw, files, a rasp, hammer, nails and some cold glue I made my first "knife". A bit of red paint on the tip and it was battle ready. This was a prized weapon and did a lot of duty in the cowboy and crooks wars for many years to come. Unfortunately no photo was ever taken but this is more or less what it looked like. Other attempts at making knives during my school years ranged from sharpening hacksaw blades to grinding down old files. Most were utterly unsuccessful and were only good for playing "peggy". I realized that I needed the proper equipment to have any joy and did not have the equipment or know-how for hardening and tempering of blades. Due to a lack of funds the idea of producing knives was pushed to the sidelines. Over the years I bought a few very good knives but never gave knife making any thought again as my police salary made it impossible to buy the equipment I needed. Many years later my mother mentioned a local knife exhibition which I attended and the knife making bug came rushing back, stronger than ever before. I had a new career with a better salary and I started surfing the web and gathered mountains of information tutorials and plans. 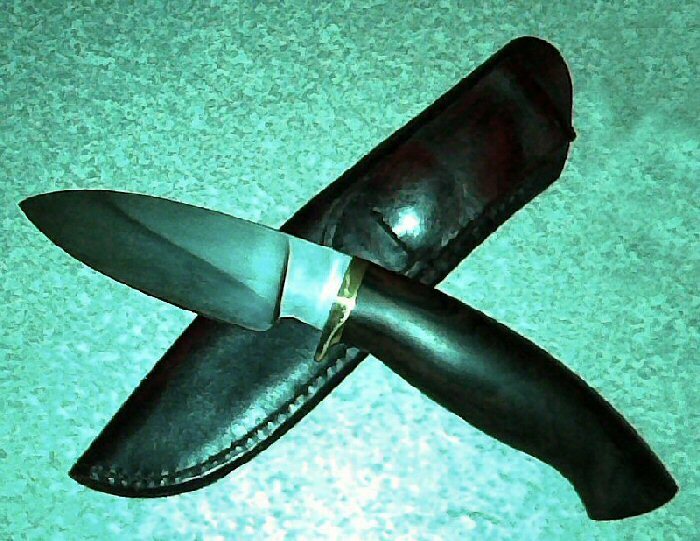 I came across a link to a full time blade smith's site that lived very close to me. It tickled me that the blade smith's surname was Smith and I contacted him about doing a knife making course. Two weeks later I was at Stuart's making my first decent real knife. This was the result. Forged from spring steel. I chose forging above stock removal as I like doing things from scratch. I started phoning around for equipment and had a knife grinder built for me. I also bought an anvil and a polishing machine. I bought steel, pipes, paint and obtained refractory materials and ceramic blankets and started building my own forge from scratch. After Starting the forge for the first time and experiencing the deep roar and the flame from it's mouth it got the nickname Dragon. Hence the original site name, Dragonforge This was later changed to Crossforge as a guy in the states decided to name his knife making business Dragonforge as well.. Most of the other tools I already had except for forging tongs. My first forging project was thus the making of my own tongs. Then I started producing knives. Being very critical the first ten or fifteen knives were simply not good enough to sell and I gave some away to family and friends while others ended up in the pile of scrap steel or the dust bin. Only after I was completely satisfied with my blades did I start selling knives. 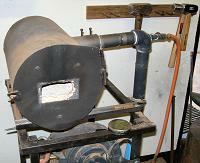 Later on I built a smaller gas postbox forge for making smaller blades up to about 20cm. A coal forge "the braai" also followed. There is just something in-explainable about using the coal forge. Maybe it's nostalgia or a longing for days gone by. The sound of the fire, the smell of the smoke and the dancing of flames has always held an attraction for me. Well, that's my boring tale. All my blades are selectively hardened to ensure a good cutting edge while retaining strength an flexibility. I mostly use natural handle material. Most of it being African hard woods, stabilized if needed. I make most of the knives to order. If you draw me a picture of what you need I will happily turn your picture into a knife. Otherwise a good description including blade length, width and shape and the purpose it is intended for will also do. You are also welcome to browse the shop to see if I have any finished knives available, but most of the time I have a waiting list of orders, so if something is available you got lucky.